Providing textual analysis of 12 feature films written and directed by filmmakers who explore aspects of the Chicano cultural movement, this book discusses films including Cheech and Chong's Still Smokin' (1983), El Norte (1985), and Break of Dawn (1988). The text analyzes the portrayal of Chicano, or Mexican American, identity in films by chicanos. Part historiography, part film analysis, part ethnography, this book offers a compelling story of how Chicanos challenge, subvert and create their own popular portrayals of Chicanismo. Historical stereotypical images in Hollywood films are discussed alongside contemporary images portrayed by Hollywood studios and independent Chicano filmmakers. 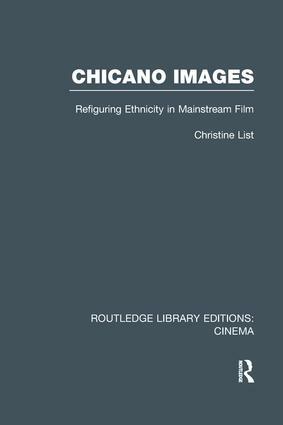 The author examines the way in which newer films "construct new representations of Chicano culture" and present a greater variety of images of Chicanos for mainstream audiences. Originally published in 1996, this authoritative volume provides a full history of the Chicano cultural movement beginning in the 1960s as well as information on the development of Mexican American film production.